Esse Diem is pleased to welcome returning essayist Anne Clinard Barnhill! This is Anne’s second essay for the Essays on Childhood project. I am tremendously grateful to Anne for her willingness to share her perspective and writing talent with this initiative. Anne’s first essay, Winter Solstice, appeared in January 2011. In Melungeons & Mystery, Anne explores her earliest comprehension of racial prejudice in her community, as well as how she responded to it at the time and since then. Her writing considers a little-known ethnic group in Appalachia, the Melungeons. For more than a century, the Melungeons have been the focus of anthropologists, social scientists, and (especially) feature writers for newspapers and magazines. The most common adjective used to describe the Melungeons is “mysterious;” no one seems to know where the Melungeons originated. More significantly, the Melungeons did not fit into any of the racial categories which define an individual or group within American society, they were considered by their neighbors neither white, black, nor Indian. A Google search for images associated with the word “Melungeon” generates some unusually striking human features, and includes such famous faces as Abraham Lincoln and Elvis Presley. Anne has been writ­ing or dream­ing of writ­ing for most of her life. For the past twenty years, she has pub­lished arti­cles, book and the­ater reviews, poetry, and short sto­ries. 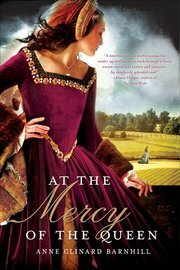 Her debut novel, AT THE MERCY OF THE QUEEN, will be released from St. Martin’s Press January, 3, 2012. She has a wonderful recently launched Facebook page, Anne Clinard Barnhill (Writer), where she networks with fans and other writers. Her work has won var­i­ous awards and grants. Anne holds an M.F.A. in Cre­ative Writ­ing from the Uni­ver­sity of North Car­olina at Wilm­ing­ton. Besides writ­ing, Anne also enjoys teach­ing, con­duct­ing writ­ing work­shops, and facil­i­tat­ing sem­i­nars to enhance cre­ativ­ity. She loves spend­ing time with her three grown sons and their fam­i­lies. For fun, she and her hus­band of thirty years, Frank, take long walks and play bridge. In rare moments, they dance. When I was twelve years old, my family moved from Huntington, West Virginia, to a very small town in the north central part of the state where the wild hills seemed a wonderland of color: the early, pale greens of spring giving way to the deeper shades of summer leaves and grasses; the slow turn to yellow, then brown, with sudden red maples dotting the hills like spots of blood. There was a deep purple weed that seemed to have come from the wand of a dark fairy. As the leaves fell, they left the trees bare against that bright blue November sky, etchings made by a larger hand than any I knew. Then, finally, the world made clean again with the white, blinding snows of winter. In our gray house on the top of college hill, I felt safe and at home in a way I have never been able to recapture. Though the surroundings were lovely, there was an underside to all that beauty. That year, as I started eighth grade, I learned about prejudice and the strange contours it can cast over a small community. I also learned that no matter how lovely the seasons of the earth, humanity could smear such beauty with its ugly handprint, a ragged blur that could keep a person from seeing clearly. I had no idea why he would say such a strange thing to me. Did my mouth look too wet? Did I look like I didn’t know how to kiss properly? Granted, I’d never been kissed, but I had hoped such innocence was not legible from a look at my face. I was secretly thrilled that he had thought of kissing me and deeply disturbed that he had called me such an unattractive name. I didn’t know much about boys, coming from a small family: mother, father, two girls. So, in order to figure out what he meant by the ogling and that strange comment, I asked a girl with whom I had become friendly. We were in the grungy junior high bathroom, fixing our hair, teasing it into high piles atop our heads. She was shorter than I was, and very popular. I decided she would know what to do in my situation. “Do you know that boy, Ronnie?” I asked, my voice soft. “I don’t know his last name — he’s in my history class. He has real blond hair and blue eyes. He’s skinny and his clothes are sometimes muddy,” I said. “Oh, I know who you mean…why do you want to know about him?” she said. “I think, well, I think I might like him — you know, for a boyfriend,” I whispered. “You CAN’T like him — don’t you know? He’s a guinea!” she said. Her face showed such outrage you’d have thought I said I was in love with Satan himself. “Don’t you know anything? He’s from up on the ridge. That’s where they all live. White people don’t mix with them,” she said. This statement had me thoroughly confused — white people?? He was blue-eyed and blonde and looked as white as anyone I’d ever seen. She made no sense to me. “But he is white. I don’t understand,” I said. “He may look white but he’s not. Just don’t hang around with them or you’ll never be popular here,” she said, her eyes shooting me a warning. I’m ashamed to say that I did not look at Ronnie again. And he never spoke another word to me. But my girlfriend’s information continued to confuse me. I’d seen the racial tension occurring across the nation — it was the early 1960’s after all. Dr. King was on TV frequently and I loved the ideas he expressed. My father, a college professor, reiterated how right Dr. King was and how all people should be treated with respect and dignity. Though I did not believe in being prejudiced, at least the black/white question made a sort of sense to me — the groups looked different and it was easy to tell who was who. But the crazy prejudice at my school made no sense whatsoever. Everyone looked the same — there were no black people that I could see. Yet, the guineas, labeled such by the natives, suffered terrible abuse and bullying. Because there seemed to be no rhyme or reason to the bigotry in that little town, I learned there was no rhyme or reason to bigotry anywhere. Harboring prejudice simply made no sense. As I grew older, I learned that many students from nearby West Virginia University had studied this tri-racial group, and the Appalachian Mountains housed thousands of what the books called Melungeons. I became fascinated with their history and story, and ended up writing an early novel about a Melungeon woman. The book is still in progress and I have hopes it will someday be published. Now, if you look on the Internet, you can find all kinds of information about this people and their mysterious past. Some think they are descended from Portuguese sailors who intermarried with Native Americans. Others believe that when the Virginia colony made being a freed slave illegal, many of the African-American men and women who had earned their freedom as indentured servants headed to the hills for safety. There, they intermingled with Native Americans. Another theory suggests the Melungeons are descended from Turkish explorers. No one seems to know for certain. What we do know is that as whites expanded west, they did whatever was necessary to secure the best lands for themselves. They made it illegal for non-whites to own land, and the lumped everyone — African-American, Native American, Arabian — into the non-white category and forced them to register their race. That way, the white settlers could purchase the flat lands in the valleys, forcing the other people onto the ridges. Such treatment is part and parcel of our American heritage, regrettably. The idealistic rights written by Jefferson did not play out fairly; there was the ugliness of reality beneath the beauty of the language of justice for all, just as the majesty of the mountains was marred by those willing to spread prejudice and inequality the way they spread molasses on their biscuits. These days, I find myself attracted to the mystery of the Melungeon people and am happy to see so many of them taking pride in their heritage. We are lucky in America. We have lots of fascinating groups of people — different in culture, religion and outlook–yet, we can celebrate the many cultures just as we celebrate the various flowers of a garden, each petal beautiful in its own way, contributing to the bouquets we treasure. I remember the Melungeons and discussion of them when I was a student at WVU and then a journalist there in NC West Virginia. Another hidden part of American history. Thanks for your comment, Val…..Anne’s idea for an essay on this topic was the first I had ever heard of this group, and I grew up in WV. Anne, I have never heard about this group. I sure will do some searching. You have inspired me to look into my past and my own experiences with racism. I find quite a few in my 80+ years. Your descriptions about WVbeauty fed into some writing I am attempting. I will not steal them but just be moved to look with a keener eye to find hidden colors and shapes. Helen, I’m so glad you are writing! This has always fascinated me. I just bought The Resurrection of a Proud People by Brent Kennedy. “As early as 1654, English and French explorers in the southern Appalachians reported seeing dark-skinned, brown- and blue-eyed, and European-featured people speaking broken Elizabethan English, living in cabins, tilling the land, smelting silver, practicing Christianity, and most perplexing of all, claiming to be “Portyghee.” Declared “free persons of color” in the late 1700s by the English and Scotch-Irish immigrants, the Melungeons, as they were known, were driven off their lands and denied voting rights, education, and the right to judicial process. The law was enforced mercilessly and sometimes violently in the resoundingly successful effort to totally disenfranchise these earliest American settlers. I’ve read parts of that book when I was doing research for my own novel. I find the whole mystery quite fascinating and love letting my mind do its ‘what ifs’. Thanks for reading, ya’ll!